Single mum-to-be Lindsay Holland is hoping for a fresh start in her sleepy New England hometown. First on her agenda is finding a way to support herself and her precious baby. But the only job opening is as an office manager for her high-school sweetheart - the man she once ran from. She knows Brian Calhoun needs help resurrecting his family's blacksmith shop, but can she get him to take a chance on her? Organizing a Valentine's Day fund-raiser together makes Lindsay realize just how much she wants a second chance with the handsome craftsman. As sparks fly, can they transform their rekindled friendship into a new, loving family? 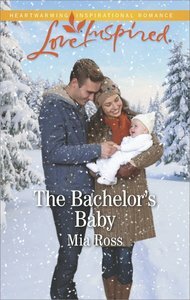 About "The Bachelor's Baby (Liberty Creek) (Love Inspired Series)"